Finca Verde Lodge is situated in Norther Costa Rica, 25km south of Upala. The siutation of our farm allow visitors to visit areas of interest and national parks easily. We would reccomed that if you are travelling by car you use a 4x4 as some of the local roads require one and it will be a much more comfortable journey around this part of Costa Rica. • Take the Pan-American highway north from San Jose. • 7km north of Cañas, turn right at the intersection for Upala (route 6). • Continue along this road until you reach Bijagua (approx 30km). You will see an orange sign about halfway along this road for our Lodge and more signs once you arrive in Bijagua. • Once in Bijagua, follow the main road until a small intersection on the right. There is a small supermarket on the corner called Super El Mercadito. • Turn right at the intersection. Pass the soccer field and high school on the right. • At the following Y-intersections, keep right. • Follow the “Finca Verde Lodge” signs and drive 1km uphill to arrive at our farm on the right side of the road. It´s a bit bumpy, drive slow! • You can catch a public bus from San Jose to Upala which passes through Bijagua. The trip takes about 4hrs. Tickets can be bought in advance at the bus station and cost around US$10. Buses leave from San Jose to Upala at 6:00am, 10.15am, 3.00pm and 5.00pm. • Go to the Terminal Transnorte de Upala. Calle 12 (12th St) between Avenues 3 and 5 (Ph 2221-3318). Alternatively, you can also take a bus to the bus station in Cañas (from various locations, including Liberia and Fortuna, Puntarenas) and then another bus from Cañas to Upala, stopping in Bijagua. Buses from Cañas to Upala depart regularly. 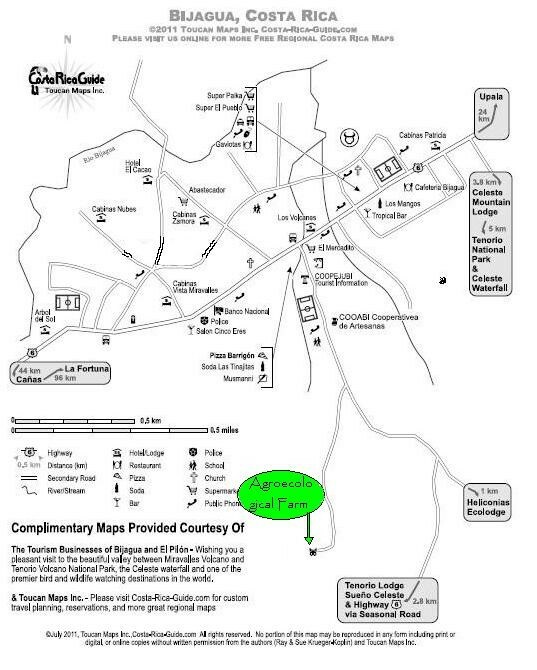 Note: Agroecological Farm and Finca Verde lodge is the same place.